— John Kasich on Sunday, January 25th, 2015 in comments on "Fox News Sunday"
By Lauren Carroll on Sunday, January 25th, 2015 at 4:01 p.m.
Ohio Gov. 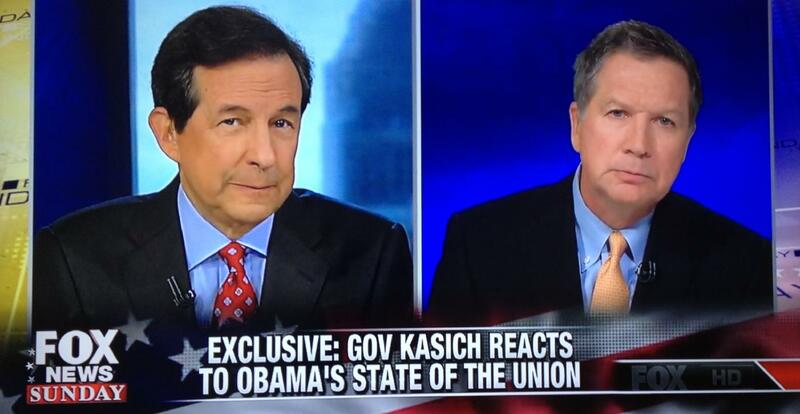 John Kasich appeared on "Fox News Sunday" on Jan. 25, 2015. In his argument against President Barack Obama’s proposed increase in capital gains tax, Ohio Gov. John Kasich invoked the words of a vaunted former president -- or at least he tried. Obama wants to create a nationwide free community college program. How he proposes to pay for it -- partially by increasing taxes on the wealthy via a higher tax rate on income earned from selling assets -- would be "a prescription for economic slowdown," Kasich, a Republican, said on Fox News Sunday Jan. 25. To support his position, he relayed a quote that he said comes from former President Abraham Lincoln. "You can’t build a little guy up by tearing the big guy down," Kasich said. "Abraham Lincoln said it then, and he’s right." There’s only one problem. Lincoln never said that. The true author is Rev. William J. H. Boetcker, a minister-turned-public speaker, born in 1873, eight years after Lincoln was killed. After he left the pulpit, Boetcker, a political conservative, negotiated labor relations. In 1916, Boetcker published the list of "10 Cannots," a collection of personal truisms largely centered around the benefits of laissez-faire capitalism. The axioms have been mistakenly attributed to Lincoln for decades. So why do Kasich and others these quotes to Lincoln? It stems from Boetcker himself, according to Did Lincoln Own Slaves? And Other Frequently Asked Questions about Abraham Lincoln, a book by Gerald Prokopowicz, a Lincoln expert at East Carolina University. In 1916, Boetcker published leaflets that had a real Lincoln quote on one side and his "cannots" on the other. A reader could easily assume these were also Lincoln quotes, and they did. Kasich’s spokesman pointed us to the fact that in 1950, Rep. Frances Bolton, R-Ohio, read the 10 Cannots into the Congressional Record. She supposedly got them from one of the earliest talk show hosts, Galen Drake. A 1950 Library of Congress report said of the frequent misquotation, "There seems to be no way of overtaking the rapid pace with which the mistaken identity has been spreading," according to a 1992 Washington Post column. Probably the most well-documented misuse of these quotes came from Reagan at the 1992 Republican National Convention in Houston. Reagan said, "What (Democrats) truly don't understand is the principle so eloquently stated by Abraham Lincoln: ‘You cannot strengthen the weak by weakening the strong. You cannot help the wage-earner by pulling down the wage-payer. You cannot help the poor by destroying the rich. You cannot help men permanently by doing for them what they could and should do for themselves.’ "
So we’ve established that Lincoln did not say that line Kasich used to support his position against raising taxes on the wealthy -- "You cannot help little men by tearing down big men." But we were left wondering if, in any case, does this at all line up with Lincoln’s position on taxes? As it turns out, not really. Well, Lincoln signed the first federal income taxes into law in 1861 in order to fund the Civil War. What’s more is that these taxes were progressive -- meaning that the wealthier people paid higher tax rates on their income. The highest rate -- 5 percent -- applied to incomes roughly equivalent to $1 million today, Prokopowicz told PolitiFact in an email. "To the extent that signing the bill indicated his approval, Lincoln thus approved of the concept of higher taxes on the wealthy," he said. "This is consistent with Lincoln's politics generally." In a reminder of how much political parties have changed, Weber noted that it was the conservative Democrats taking Lincoln, a Republican, to task over executive overreach and implementing taxes. There is "precious little" record of Lincoln’s views on taxes, said Ed Steers, author of several books on the Lincoln assassination. But he pointed us to a speech Lincoln delivered to the 164th Ohio Infantry in 1864, where he advocated for the progressive tax law. Lincoln said: "It is fair that each man shall pay taxes in exact proportion to the value of his property; but if we should wait before collecting a tax, to adjust the taxes on each man in exact proportion with every other man, we should never collect any tax at all. " Prokopowicz added that Lincoln believed strongly in "opportunity capitalism" and that the government should not adopt policies that would prevent anyone from acquiring wealth. However, Lincoln also believed that the government had a vital role in creating opportunity, and individuals ought to contribute to the government in order to reap its benefits. "I go for all sharing the privileges of the government, who assist in bearing its burthens," Lincoln wrote in 1836 while running for the Illinois state Legislature. Kasich said that Lincoln said, "You can’t build a little guy up by tearing the big guy down." It’s well-established that this is not a Lincoln quote. Many have misattributed it to Lincoln, but its real author was a politically conservative minister and public speaker who was born several years after Lincoln’s assassination. Additionally, Kasich used the idea to support his position against raising taxes on the wealthy. Lincoln, however, instituted the first-ever federal income tax, and it was progressive. Published: Sunday, January 25th, 2015 at 4:01 p.m.